Do you want a higher capacity a portable fridge/freezer without sucking your vehicle’s battery dry? The ARB 50 Quart Fridge Freezer provides more capacity and greater cooling capability than standard car coolers. 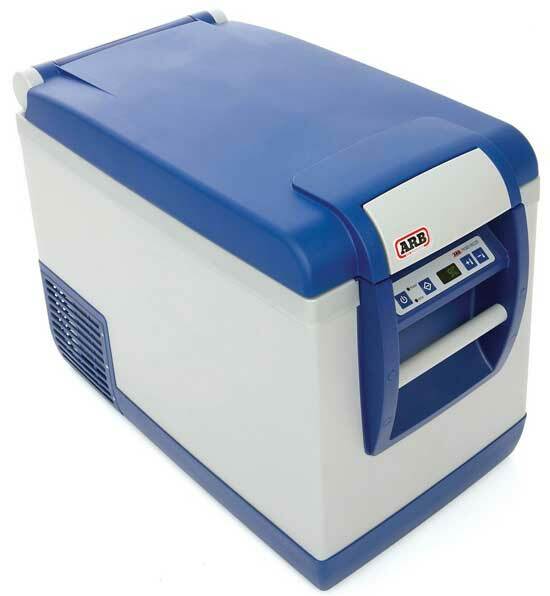 ARB makes several portable fridge/freezers, the 50-Quart size being the most popular. With a smaller footprint, it fits easily in SUVs and trucks, yet the inside compartment is large enough to hold up to 72 12-ounce cans. This size car cooler can accommodate and chill plenty of food and drinks for a group of people. However, it is not so big that it consumes excess unneeded energy because it is so large. In addition, people like ARB coolers because they consume less energy that other similar electric coolers. In fact, it uses less energy than a single headlamp (0.87 amps per hour to be exact), and that is on a hot 90-degree day. You can attribute this to the efficient insulation built into the cooler. However, don’t assume that a thick insulation will minimize the internal space. Quite the contrary, actually. ARB features the largest-in-class internal capacity for vehicle fridge freezers. Plus, the ARB has an adjustable integrated battery protection system. Therefore, it can operate while your vehicle is off without quickly draining your car’s battery. This is not your grandmother’s refrigerator. In fact, this heavy-duty weatherproof appliance is designed for off-road use. For example, you can bold this unit to your vehicle. And the handles can hold tie-down systems. In addition, the fridge/freezer can operate while at a 30 degree angle. You can still count on it to run reliably, and for many years. This tough and rugged cooler also includes a variety of convenient features, like an internal LED Light, electronic temperature controls. Plus, the outer control panel has a bright easy-to-see display with large buttons. You can separate delicate items into different compartments within the cooler. In addition, the removable drain plug makes the unit easy to clean and air out when needed. What is the Best Price on a New ARB 50 Quart Fridge Freezer? The best price I’ve found on the ARB 50-Quart is about $855 through Amazon In fact, they sell a new unit for about $75 less than the manufacturer themselves. Plus, when you take into account the cost savings with this efficient compressor refrigeration system divided by many years, well, you get a pretty good deal. Alternatively, you sometimes can find a new or refurbished ARB 50-Quart Cooler on eBay for about $30-$50 less. However, I have yet to find one used. The Operating and Service Guide provides a complete instruction manual (PDF), including appliance settings, specifications, warranty information and troubleshooting. Unexplained fault codes? A concern that sometimes comes up involves the fridge flashing a “low voltage” code and shutting off. This post explains why this situation happens and how you can fix it using a cost-effective wiring kit. Do you have problems that you need help solving or need spare parts or 4×4 accessories? You can also contact ARB directly through their website, email (sales@arbusa.com) or toll free customer service phone number: (866) 293-9078. 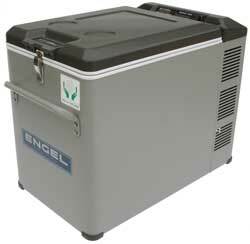 Let’s review and compare the Engel 43-quart fridge/freezer to the ARB 50-quart. The Engel measures a couple inches shorter in length and .5 inches shorter in width, but you give up 7 quarts of interior space. Average DC power consumption for the ARB is 0.7 to 2.3 amp/hour, whereas the Engel varies from 0.7-2.5 amps. Other design features and capabilities are very similar as well. It costs about $50 less. In addition, Dometic makes a 50 quart portable fridge/freezer that can cool to -7F (compared to 0 degrees of the other models). It measures a couple inches shorter than the ARB, but makes up for it in extra width. 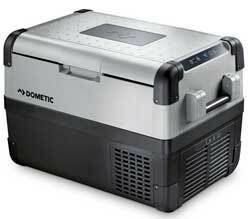 The Dometic also has the interior LED light, rugged build and low power consumption. The price falls right in between the ARB and the Engel. They all give you AC and DC power options. Plus, you can get optional slide mounts for each. I hate to say it, but this may be a tough decision because the ARB 50 Quart Fridge Freezer is not the only great option.